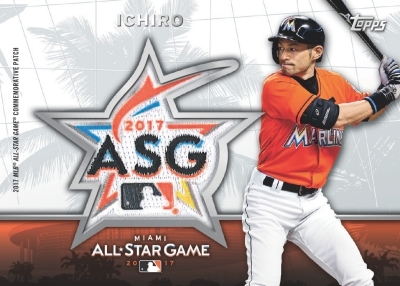 Becoming a yearly tradition, the 2017 Topps All-Star FanFest Baseball promo set is available at the Midsummer Classic FanFest in Miami. The exclusive options consist mainly of a small base set and several relic patch cards. 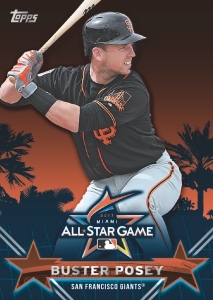 The main wrapper redemption offers six cards, including Buster Posey, Giancarlo Stanton and Kris Bryant. Each card is individually redeemed by opening three packs of any 2017 Topps products, with the exception of Opening Day and the Sticker Collection, at the Topps booth. However, collectors are limited to just one card per subject during each day of FanFest. 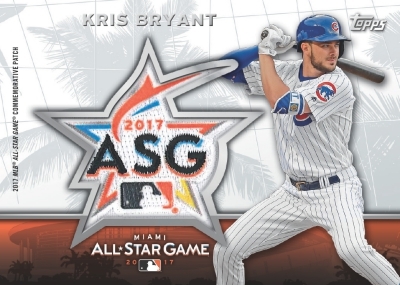 Topps is also selling 2017 Topps Baseball complete sets with a commemorative All-Star Game patch. 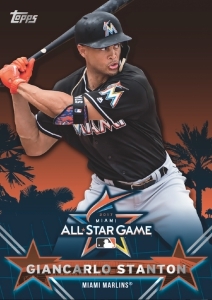 Honoring the host team, current Miami Marlins players Giancarlo Stanton and Ichiro are among the six manufactured relic options, along with Miguel Cabrera in his Florida Marlins uniform. Additionally, fans can purchase an autographed Ichiro Topps Authentics 8x10 Jumbo Bowman card. 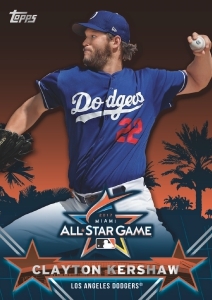 However, these 2017 Topps All-Star FanFest Baseball exclusives aren't the only attraction. Other Topps events include box breaks and a sneak peek at 2017 Topps Stadium Club Baseball, as well as other various giveaways and contests. The 2017 MLB FanFest runs from July 6 to July 11, at the Miami Beach Convention Center. This is a tentative checklist. We'll add more specific info when available. 6 cards. One earned for each 2017 Topps Baseball complete set purchased at FanFest.